JCBD Management District Plan responds to today’s market opportunities and district challenges. The District will provide new improvements and activities, including both environmental and economic enhancements. Each of the activities is designed to meet the goals of the District; to improve the appearance and safety of the District, to increase building occupancy and lease rates, to encourage new business development and attract ancillary businesses and services. 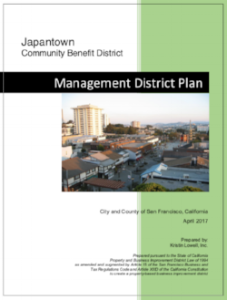 As described in the Management District Plan, it is proposed that the JCBD will provide funding for enhanced maintenance, safety, beautification and marketing programs, above and beyond those provided by the City of San Francisco. The engineer’s report describes the services to be provided by the JCBD; (1) security, (2) streetscape maintenance (e.g., street sweeping, gutter cleaning, graffiti removal), and (3) marketing, promotion, and special events. They are all services over and above those already provided by the City within the boundaries of the JCBD. The Japantown Community Benefit District celebrated its first-year anniversary in November of 2018. 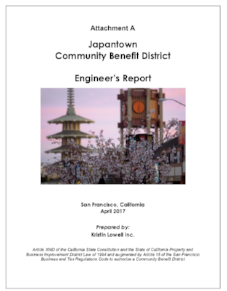 The Mid Year report documents the achievements of the organization and the improvements made to keep Japantown safe, clean and thriving.